First, does a House Speaker have the right to ban a president from the House gallery? It would seem so. Second, what has been the setting for some of President Trump’s most rousing and riveting connective moments? That would be at large rallies. State of the Union addresses have become predictable yawners for most except the political junkie community. It may be that the government shutdown has helped us realize that we’ll manage just fine with a written report, as was the habit for most of our nation’s first century. But for this year, with the government shutdown battle lines drawn, Nancy Pelosi’s snub of Trump creates an opportunity that should not be missed. 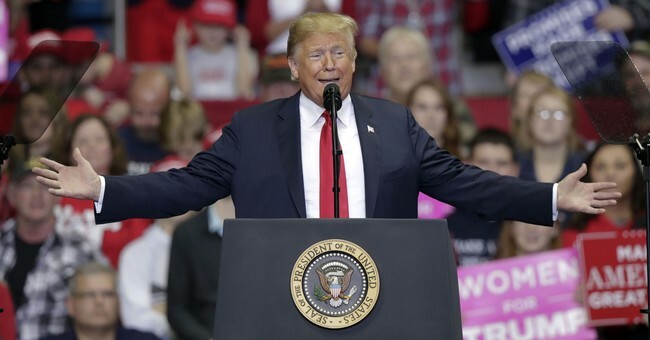 If the House will not have him, he should walk into the glorious environment that fueled his campaign and has enlivened his presidency: a stadium filled with thousands of cheering Americans. If it can be logistically assembled by January 29, that date should feature the first-ever People’s State of the Union. This moment of riveting political theater would be a study in contrasts. The usual State of the Union is delivered to the most exclusive of audiences; this one would be for all comers. As the president speaks, the norm is for roughly half of the room to applaud while the other half sits lifelessly; this crowd would roar with approval throughout. And usually, the State of the Union is a predictable litany of dry policy ideas mixed with well-worn platitudes. The People’s State of the Union would likely feature a blistering, relentless indictment of the Democrat Party’s failure to protect our borders. Speaker Pelosi crafted an absurd excuse for sabotaging the address, citing security concerns that security officials instantly identified as fake. She lobbied for the speech to be delivered after the shutdown is resolved, knowing her party is losing the shutdown skirmish bit by bit with each passing day. It is obvious that while many conservatives find an instructive moment in government stoppages, they are positively gut-wrenching to liberals. Hence their constant (and empty) pledges to negotiate once the doors of government are re-opened. Imagine the anticipation as the venue is selected and arrangements begin for the People’s State of the Union. Imagine the lines that night (or the day before) at whatever location is chosen. Imagine the gnashing of Democrat teeth as Pelosi’s “power play” morphs into yet another presidential PR slam-dunk. I’ve been fortunate to attend a State of the Union or two, and it is heady stuff. The rarefied air of the surroundings, the security funnels necessary to reach the inner sanctum of the House gallery, the unique sensation of sitting in a room with a few hundred watching a speech consumed elsewhere by millions. This would turn that entire spectacle on its head. Millions would still watch nationwide, but they would see a seething throng of Americans on hand to support a rare and precious sight: a Republican refusing to cave under pressure. The Constitution requires only that the president give Congress information “from time to time.” The founders did not require a speech of any type. But since that’s the tradition we have established, let’s not dismantle it before one last chance to enjoy one for the ages. I’ll leave it to talented organizers to assemble the program, choreograph the dignitaries and finalize arrangements, but there is just one vital suggestion I would contribute: a front row seat for the Speaker of the House.